Between the hall and the river, the medieval Temple consisted of gardens or fields, where members might seek recreation. They were known for their fine rose-bushes, and according to Shakespeare – whose story has not yet been corroborated by contemporary evidence – the wars of the roses began there. In 1601 the Inner Temple gardens were newly laid out with ‘large and lovely walks . . . ornified with beautiful banks, curious knots and beds of fragrant flowers, and sweet herbs of sundry scents’. The decorated railings included, by 1618, carvings of the Inner Temple pegasus and the Gray’s Inn griffin, in token of an ancient amity between the two inns. 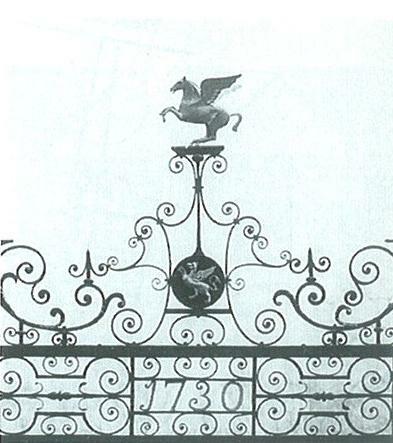 Both beasts are to be seen on the present wrought iron gates, erected in 1730. In the gardens are a sundial of 1707, and two cisterns dating from 1774. After Clement’s Inn was destroyed, a kneeling leaden blackamoor by Van Ost was transferred from its gardens to those of the Inner Temple. Near the pond is a more recent lead statue of a boy (1928), by Margaret Wrightson, with a quotation from Lamb’s essay on the old benchers of the Inner Temple (‘Lawyers, I suppose, were children once’). Wrought ironwork on the garden gate. By Richard Ellis, 1730. The walks were divided into two by the extension of Paper Buildings. On the eastern side were the King’s Bench Walks, named after the King’s Bench office which was kept there, and the Lower Walks; on the west side were the Gardens proper. In the eighteenth century, the walks were made into a single avenue, now known as King’s Bench Walk, incorporating the former Exchequer Court at the northern end. It was a place frequented by attorneys for outdoor consultations with their clients. The gardens led down to the river, and to the wharf (known since the fourteenth century as Temple Bridge or Temple Stairs) from which lawyers and others could take the morning barges to Westminster Hall. When the Thames embankment was constructed in 1767-70, the gardens were extended and a special wharf was erected for the use of the two Temple societies, preserved when the Victoria Embankment was created a century later.